On April 8-10 the INDEPENDENT BAPTIST CONFERENCE will coming to the Milwaukee, WI, area. The host church is the FAITH BAPTIST CHURCH of Oak Creek, WI., pastored by Dr. Dean Noonan. It is time to return to those Biblical principles used by the giants of the faith of the previous generation to begin building great soul winning churches once again. WHAT HAS BEEN DONE CAN BE DONE! In addition to spirit filled music and spirit filled preaching, classes will be conducted covering vital areas of the ministry. Classes for laymen will be conducted by Dr. Russell Anderson, classes for pastors and staff conducted by myself with free materials, ladies classes conducted by Mrs. Noonan, and youth classes conducted by Youth Pastor Matt Kielas. Dr. Paul Duckett Sr. sang for and led singing for J. Frank Norris on many occasions. He is a godly man who is spirit filled and his music is used by the Holy Spirit to touch souls. You will never forget the song services after participating in this meeting. In addition there will be a special Businessman’s Luncheon with Dr. Russell Anderson Tuesday at noon. 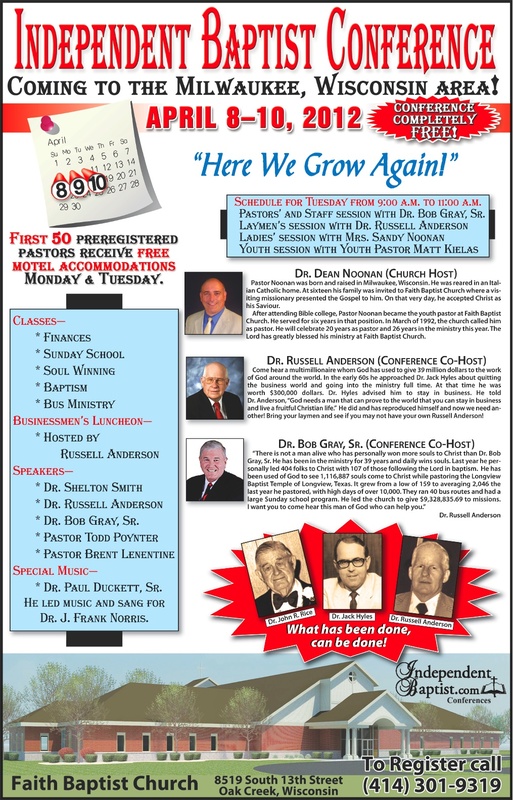 Dr. Anderson has a burning desire to help laymen to help their pastors. He ran 7 successful businesses which allowed him to give 39 million dollars to the work of the LORD. He gave 8.5 million in one day! No man in history has given as much to the work of God let alone Independent Baptist Churches. The things God taught Russell Anderson must not die with Russell Anderson! WHAT HAS BEEN DONE CAN BE DONE! The first 50 pastors with their wives who call and pre-register will have provided for them motel accommodations for both Monday and Tuesday. Please attend and bring your laymen to this unique conference. Also, start praying for the Holy Spirit to come upon this meeting and transform us into “on fire” servants. WHAT HAS BEEN DONE CAN BE DONE! God is not a respecter of persons. God did not love Dallas Billington, Billy Sunday, Jack Hyles, G. B. Vick, Lee Roberson, Tom Malone, John R. Rice, or Curtis Hutson more than he does you and me. I absolutely refuse to believe God cannot do it again. He is still looking for someone who will surrender all and give their all! We do not need to be stirred or changed for we need to be “TRANSFORMED.” WHAT HAS BEEN DONE CAN BE DONE!